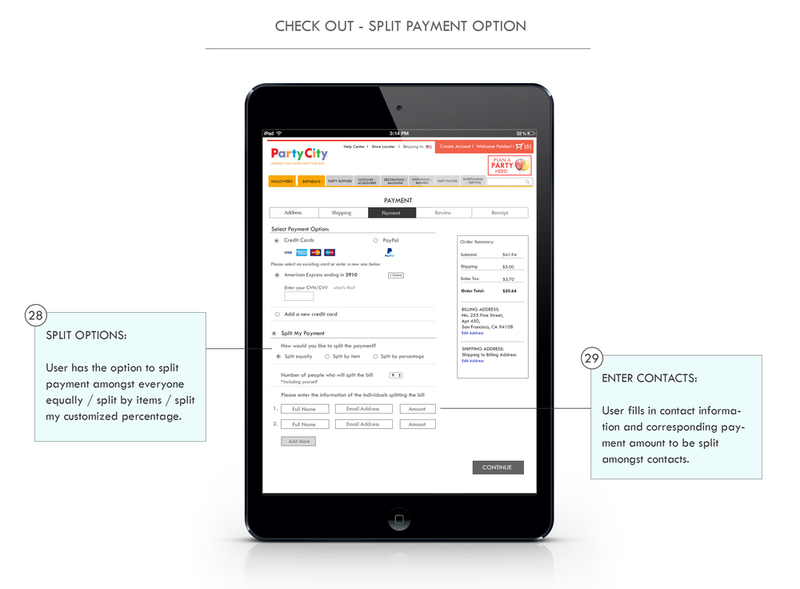 To redesign Party City's online and eCommerce platform to increase user engagement, attract more online traffic, generate higher online sales, while reducing visitor bounce rate. 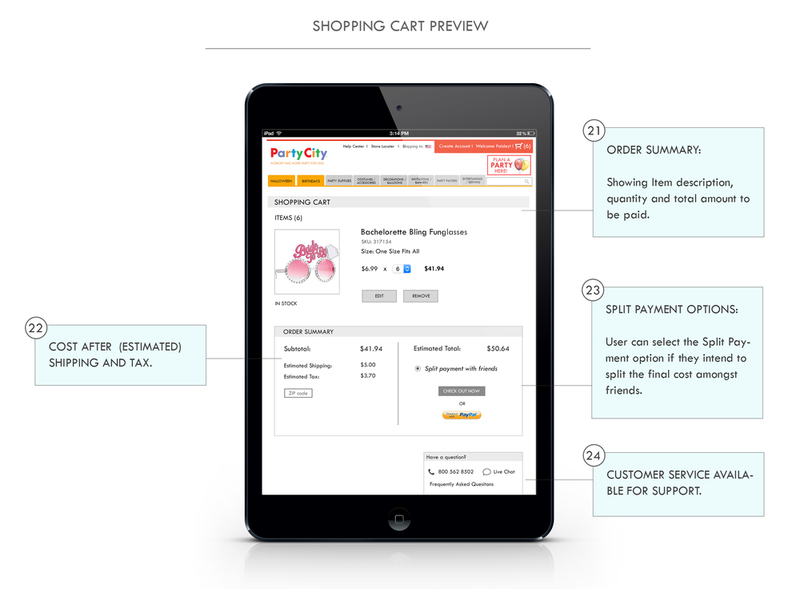 Party City's online platform features a spectacular range of product category and item selections but it lacks an effective information architecture needed to facilitate a fun and delightful browsing experience. 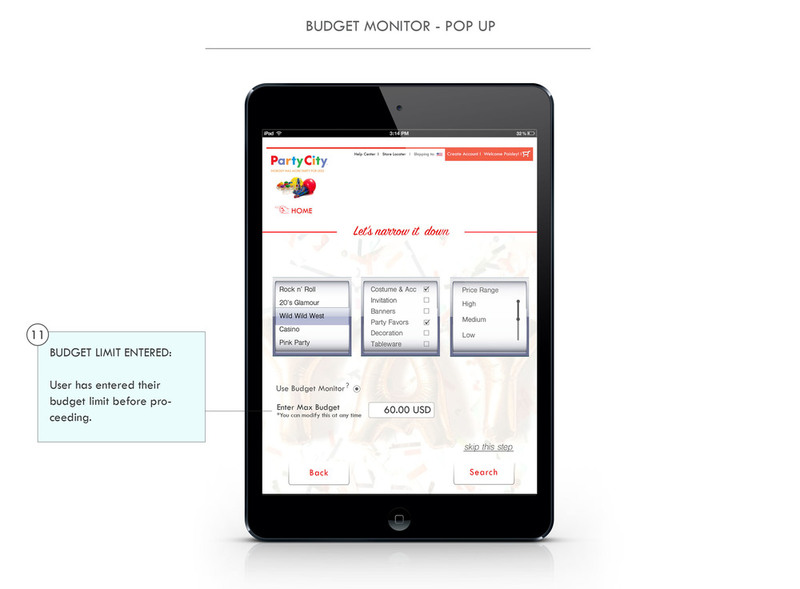 To reorganize Party City's information architecture, edit the over-saturation of UI visual elements, whilst implementing a delightful and smart browsing system that helps customer efficiently navigate and arrive at their product with minimum hassle. Although this was an individual project, i did collaborate and conduct user research with business stakeholders and online customers across multiple demographics. I oversaw the entire UX/UI process from research, data gathering, synthesis, iteration, wire-framing, usability testing, to final prototyping. The key to a satisfying browsing experience is the ability to lead users to their desired destination efficiently, and accurately. 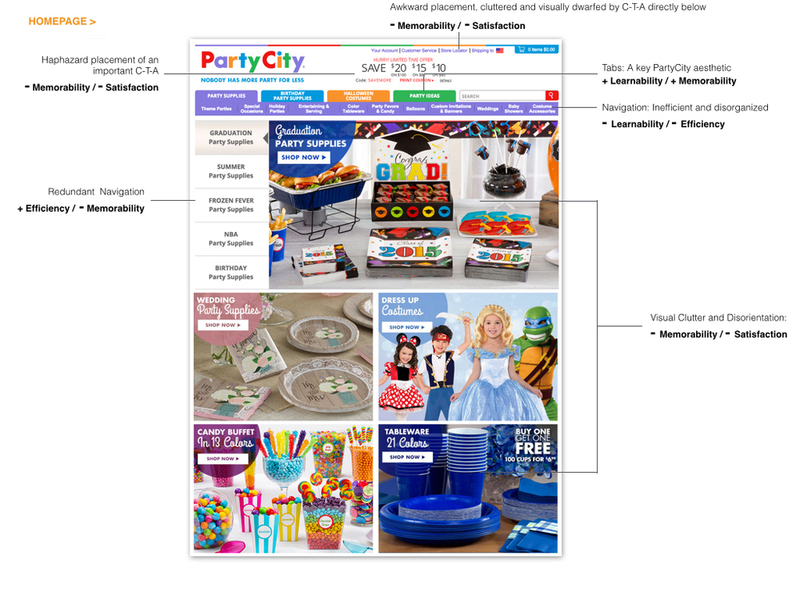 To pin point the main structural issues of partycity.com, I conducted a heuristic analysis on a regular browsing task flow and evaluated the aspects of learnability, efficiency, memorability, error management and satisfaction. 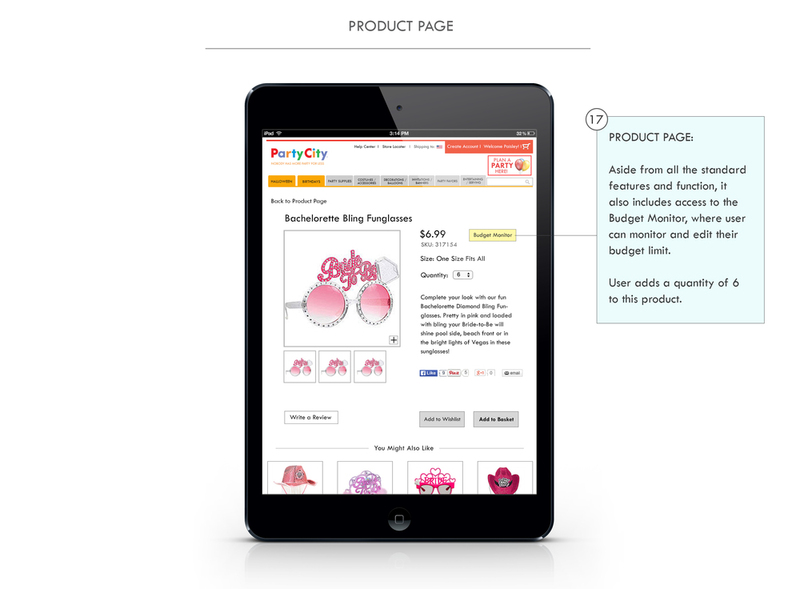 From our card-sorting, users primarily associate their searches with product categories ie. costumes, invitations etc. From there they would narrow their search down by style or context ie. theme, occasion etc. Also, incorporating a 'Feature' and 'Most Popular' category has proven to generate further interest. Based on the company's 2014 sales report, Halloween and Birthdays are the most lucrative and popular categories in their online platform. Hence I displayed them prominently in the main navigation. As mentioned in an article published by Fast.Co Design: Why White Space Is Crucial To UX Design. White space, when used methodically helps in: 1) Improving Comprehension 2) Clarify Relationships 3) Attract Attention. With this in mind, I decided to explore some of the most popular, inventory based eCommerce platforms such as potterybarn.com, williams-sonoma.com, and amazon.com and review their UI. We need to create high online engagement by merging usability with a delightful and dynamic experience through service features and visual design. Here's a mood board that encapsulates the whimsical, lively and exhilarating spirit Party City needs to communicate in it's online experience. I mapped out possible web features that could be implemented in elevating user engagement. 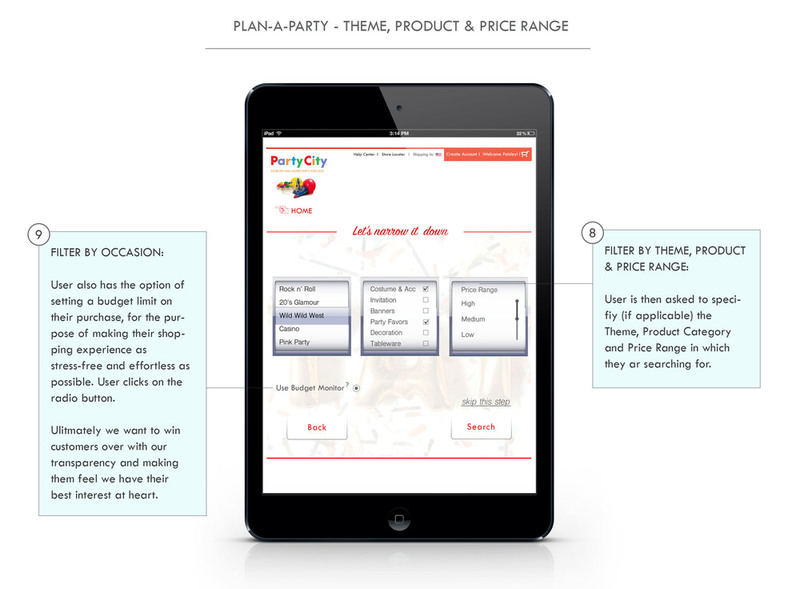 Plan a Party - A customized search filter that allow users to narrow down product results efficiently. Personal Search Results - Featuring search results, personal 'pin boards' that function as a visual scrape book. 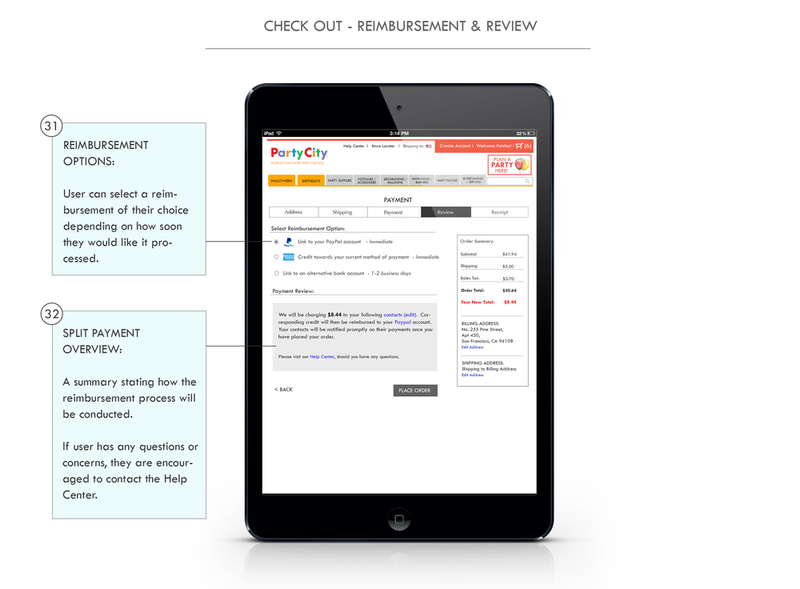 Split Payment - Allow customers to split online payment charges amongst friends/fellow party organizers effortlessly at the check out process. Below are the first series of iteration created for the main user task-flow from browsing to check out. Finally distilling all my research findings and design thinking into a high fidelity wireframe. To better understand the design flow and task at hand, I have added commentaries that will guide viewers through the process and keep them informed each step of the way. A final interactive mock up of the new platform.